Every goddamn day: 04/19/19: "Pain is the great destroyer of language"
Gold Star Monument, "I gave my best to make a better world,' Nashville, Tennessee. This is one of those columns where writing it was the easy part. The daylong trick was cutting it from 1100 to 679 words. There was the poetry aspect and the head trauma aspect and the VA botching its job aspect, with the very quotable Dawn McGuire saying things such as "I feel like I'm married to Wittgenstein" of her time getting her masters of divinity at the Union Theological Seminary. It wasn't on point, but how often do you get to use a line like that? I somehow managed. If you want more of McGuire, do get her new book, American Dream with Exit Wound, which I've read and recommend, or her previous one, Aphasia Cafe. You can hear her reading a heartbreaking and smart poem from it, "Aphasia Breaks the News," originally published, mirabile dictu, by the American Academy of Neurology Journal, by clicking here. Neurology, the official journal of the American Academy of Neurology, publishes papers on brain science with titles like "Vesicular acetylcholine transporter defect underlies devastating congenital myasthenia syndrome." It also, marvelous to relate, prints poetry. And yes, the poems are peer reviewed. 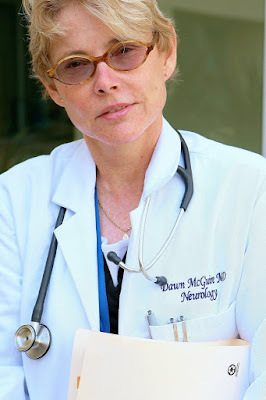 In 2012 it published "Poems from the Aphasia Cafe," from a book by Dawn McGuire, a San Francisco neurologist and poet. McGuire's poems echo her work with shattered minds, particularly wounded veterans — "aphasia" is a term for loss of speech through brain injury. McGuire, who grew up in Appalachian Kentucky and studied at Princeton and Columbia, does not mince words when talking about the vets under her care. "They come back and are expected to reintegrate without any attention to the fact they are often very young men who have been asked to really split their psyches and do things that the culture and family they grew up in would find abhorrent," she said. "There's nothing like boot camp for reintegration, where they can see they've been split by these experiences, by what they've done, what's been done to them. There's no way for vets to re-enter the regular community." Boot camp for returning vets is a great idea. We put soldiers through intensive training before they serve, but they're left on their own when they come home and often need help most. Although I'm not a veteran, I understand completely the complexities of painkillers and physical dependency, especially in the case of opioids. i've been taking hydrocodone for 15 years. Originally prescribed for arthritic hip pain, and then after years of taking them exactly as prescribed, abruptly denied further medication after my Doctor attended a conference on opioids and decided she would no longer prescribe them, regardless of the consequences. This led to my seeking them on the street. The expense has made my life a living hell - but not bad enough (yet) for me to seek treatment. The few times I've tried to ween myself were the most excruciating days I've had to survive. Withdrawal is one thing. Withdrawal with unbearable pain, quite another. I've actually considered Heroin - for the cost savings - but the imagined difference between legally manufactured pharmaceuticals, and the stigma of using "street drugs" keeps me from going down that path, thankfully. Cutting off pain medication for those in need seems to be a drastic measure that will do little to stop the epidemic. I know from experience that it will push those in desperate need to seek whatever relief they can find. Unfortunately that may be more dangerous. Boy howdy, you're not kidding. My sister has had severe, chronic, undiagnosable pain for 35 years. The only thing that makes her life bearable is massive doses of painkillers. I'm talking enough morphine to stun a moose. And the hoops she has to jump through! She has to take a urine test each time she gets a prescription to prove that she's taking the meds and not selling them. Whenever she goes to the hospital, the doctors and nurses refuse to believe she needs that much painkiller and refuse to prescribe it for her. The last time she was in, after falling out of bed and breaking her hip, I had to smuggle her pain meds in to her (an act for which I could have been arrested if caught). Even finding a doctor is an ordeal. One doctor had his license yanked, for no other reason than that the DEA (the most useless federal agency this side of the TSA) thought he was writing too many opioid scripts. Pleas that he specialized in treating severe pain fell on deaf ears. So Paul, believe me, I sympathize and hope you find a way to get what you need. Specifically, I hope you find a doctor who isn't as big a nitwit as your old one seems to be. With all due respect, are you not enabling your sister? It is amazing her major organs have not shut down. What she needs is a good Rehab program-not more pills. With all due respect, you don't have the slightest idea what you're talking about. That's terrible, Paul. Our medical system is so screwed up. more war to come. will we be there for these men and women ? Neil - thank you for an important column. We must never forget that the current need for vast amounts of veteran care and support are the result of Cheney and Bush manipulating intelligence to provide cover for the Iraqi War - a war of choice. They lied, Cheney made a lot of money for his patrons, Bush worked on some unfinished daddy issues, and countless people died and suffered - and continue to die and suffer. It was the greatest lie in American history and the consequences continue in the form of ISIS. And now we have a president who makes Bush look like a great statesman. Heaven help us. As for Cheney, he should have been jailed long ago. In 1963, my last week in the Navy was spent attending sessions of Orientation to Civilian Life (or something similarly named). The only thing I remember was the civilian job descriptions that were considered equivalent to our Navy occupations. As an Electrician's Mate 2nd Class, I was a little disappointed to discover that I would only qualify as an apprentice electrician on the outside, whereas my Commissaryman 3rd Class buddy was truly crestfallen to be told that he should seek employment as a short order cook -- he insisted that he considered himself a "chef." I believe they might have also told us it was a good idea to show up for work sober and that we could seek health treatment, if needed, at any VA facility. I did go to the VA once and the first thing I was asked was whether I was an alcoholic. Thought provoking article today Neil. The VA bureaucracy continues to act terribly towards our vets and I can't fathom why it happens. It's disgraceful. Personally, I had experience with Hines VA hospital in the early 70's and was treated very well by the doctors and nurses. My mother worked there for almost 20 years, including the time you were there. I'm glad you had a good experience, but my memory from visiting her at work is that it was the most depressing place I've ever seen. It's a fine column and I wouldn't change a word, but almost everything has a downside. In this case and others like it there can be an impression left that most people leave military service debilitated, physically or mentally. In fact, they represent a small subset of returning vets, many of whom serve without even seeing combat. It's a problem because the notion can be an attitudinal barrier returning vets entering a tight job market have to overcome. Two years ago returning vets were incurring very high unemployment rates, a situation that has probably changed for the better as the economy has improved. God bless people who deal in the alleviation of pain, or even discomfort. A neurologist friend once gave me his opinion that the greatest gift God can give to mankind is a stretchable itch. Is that an itch that can be relieved by stretching? Scratchable. The spellcheck thingee changed it on me.